If you're even thinking of being in NYC, check out the rest of our DestiNATION: New York City guide. It's stacked with expert advice from locals on what to eat, where to drink, and what to do in the Greatest City on Earth. The phrase “New York minute” could describe how long most restaurants stay open here. Depending on how you count, there might be 30,000 eateries open in the city right now -- enough for three meals a day, each from a different place, for the next 27 years -- but the most ambitious restaurants among them might stay open for only a matter of a few months. In a market this competitive, staying power becomes star power. That’s why this city is a launching pad for empires, from Danny Meyer to David Chang. It's also why the following restaurants -- institutions that have captured generations of hard-to-please New Yorkers -- remain true icons. In a city haunted by thousands of ghosts of restaurants past, these classic spots are landmarks for a reason. Jean-Georges Vongerichten may be a major celebrity chef with a worldwide empire of restaurants, but he’s also one of the OG titans of the New York fine-dining scene. 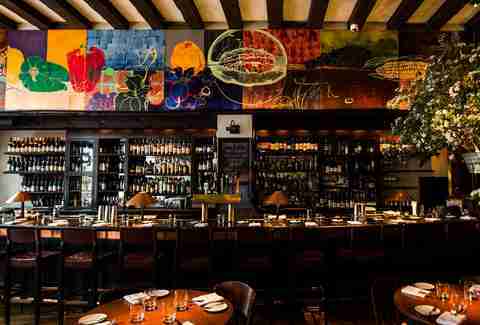 And among his 13 Manhattan restaurants, ABC Kitchen has stayed the epitome of Downtown New York dining since it opened in 2010. The menu is organic, local, and sustainable in a way that would be annoying if the food weren’t so good, and it’s the sort of place where sightings of every celebrity from Martha Stewart to Kanye West are a weekly occurrence. Being located in ABC Carpet & Home, it’s also probably the only restaurant in the city where you can furniture shop while waiting for a table. Bamonte’s, which opened in 1900, is a relic of another era -- back when Williamsburg, Brooklyn was known for its Italian community, not its hipsters. With its dim, velvet-curtained interior and tuxedo-clad waiters, Bamonte’s is one of the best examples of New York’s dwindling old-school red sauce Italian spots. Order an appetizer of clams oreganata, a heaping plate of pasta, and a bottle of red wine, and then picture yourself in a scene from The Sopranos (which filmed a few episodes here). For the last 20 years, this brasserie has defined French dining in New York and remains the closest you’ll get to feeling like you’re in Paris while still in the US. On any given afternoon or evening, you’ll find the noisy dining room packed with visitors and business-attire-clad locals, feasting on classic steak frites and massive seafood towers and clinking Champagne flutes like they have company expense accounts (to be fair, some of them do). After splurging on a meal, stop by the bakery next door for a freshly made baguette -- Balthazar’s iconic bread is carried at top restaurants throughout the city. Di Fara owner Dom DeMarco is the stuff of New York legend. The now 80-year-old has been hand-making nearly every pie himself since 1965, and it’s a treat just to simply watch him at work, hunched over the counter, stretching dough, and tearing basil by hand. 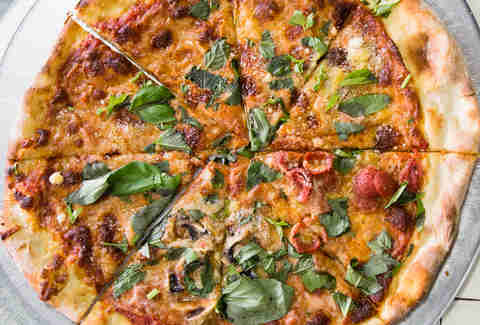 Still, the pizza itself, in both round and square forms, is what you’re here for -- made simply with a tangy tomato sauce, chunks of mozzarella, a sprinkling of Parmesan, and a little bit of olive oil. The wait is almost invariably long (often an hour or more) but entirely worth it, especially since it may not be long until DeMarco retires. 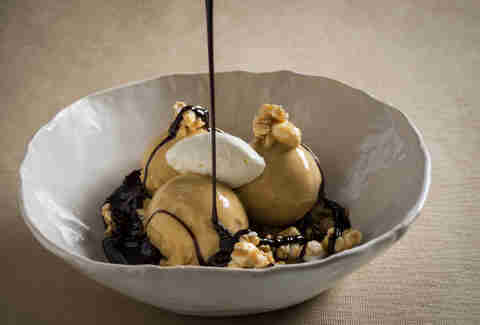 Danny Meyer is arguably the most successful and influential restaurateur in New York City, with numerous top-tier restaurants under his belt (not to mention, Shake Shack), but Gramercy Tavern is the crown jewel of his empire. You can choose to eat more casually à la carte in the front tavern room, or experience the tasting menu in the dining room -- either way, the refined farm-to-table food is guaranteed to make it feel like a special occasion. As will Meyer’s laser focus on hospitality, which guarantees you’ll be treated like royalty. 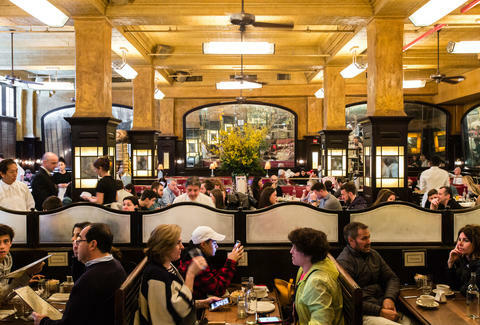 This 104-year-old restaurant, tucked in the bowels of Grand Central, is as iconic to New York as the train station’s starry ceiling over the cavernous main concourse. It’s worth visiting just to see the bar’s beautiful vaulted tile ceilings, but you won’t get the full experience unless you grab a seat at one of the counters and enjoy a platter of raw oysters or the iconic, creamy oyster pan roast. 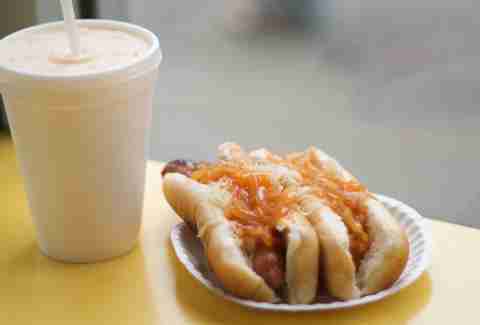 The hot dog is one of the great New York City foods, and while you easily grab a good old dirty water dog from any street cart, the better move is to head uptown to the original Gray’s Papaya. This ‘70s-era hot dog stand (not to be confused with Papaya King or Papaya Dog) slings griddled dogs and tropical fruit juices 24-7, and its “recession special” (two hot dogs and a drink for $3.50) has lasted through several economic ups and downs. Once a chain, Gray’s had recently dwindled to just one Upper West Side location, but is now making something of a comeback with a new spot in Midtown. Great barbecue isn’t exactly the first thing that comes to mind when you think of New York, but the city is actually home to a surprising number of great barbecue joints. 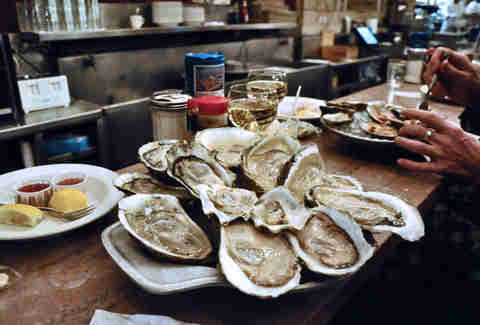 At the top of that list is Hometown, a sprawling restaurant in the far-flung Brooklyn neighborhood of Red Hook. It’s a little hard to get to, but it’s the only place in town (and maybe the country) where you’ll find meltingly tender brisket, rich smoked lamb belly, jerk baby back ribs, and extra-thick slabs of peppery pastrami bacon. The spectacle of dining at one of Chinatown’s massive dim sum restaurants is an experience that can’t be missed. 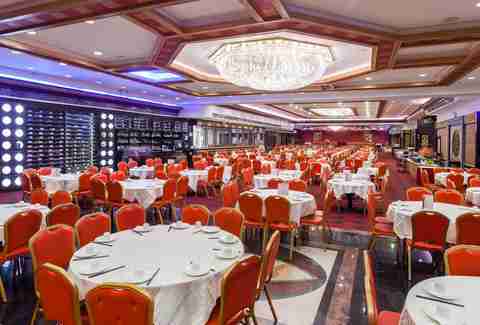 And Jing Fong, with its palatial, 800-seat banquet hall, is one of the biggest, most exciting places to do that. The place can get chaotic, with hundreds of people vying for dumplings from the carts that weave their way between the tables, but that’s all part of the fun. Just remember to pace yourself, since there are over 100 different dishes being shuttled around on those carts, and don’t miss the pork shumai, the cheung fun (rice noodle rolls), or the bacon-wrapped, deep-fried shrimp. If New York had a flavor, it would be pastrami. 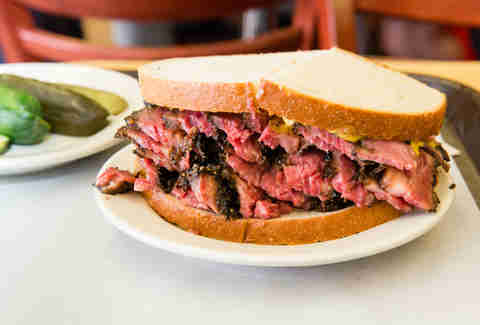 And Katz’s is the undisputed pastrami king of NYC. This sprawling LES institution has been serving thick-cut, meltingly tender pastrami on rye since 1888 and doesn’t show any signs of slowing down (especially with a brand-new location inside the DeKalb Market in Brooklyn). 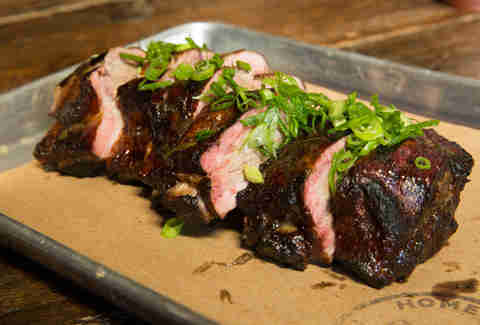 At the OG, take an order ticket at the door and go straight to the counter where a row of gruff guys cut meat to order. Also, remember to tip them, and do not, under any circumstances, lose your ticket. Keens is a true classic New York steakhouse that’s somehow managed to survive in the frenetic, oversaturated area between Penn Station and Times Square. Once a gentlemen’s club, its dining rooms still maintain that luxurious, wood-paneled feel (not to mention, the pipes of all those gentlemen hanging from the ceiling). The dry-aged steaks are excellent, but Keens is most famous for its tender, mild mutton chop. The prime rib hash is also insanely good, and though it’s only on the pub menu, they’ll give it to you for dinner if you ask. L&B is legendary for two things: its Sicilian pizza and its namesake spumoni. 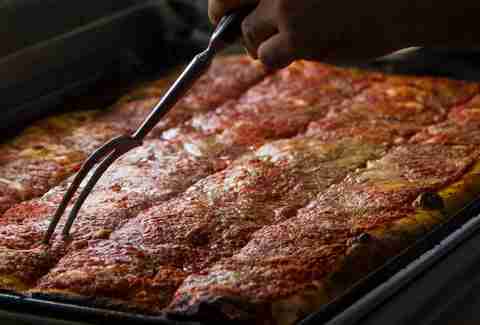 The square Sicilian pie (a variety not always easy to find in NYC) has a thick, bubbly crust with toppings put on in reverse -- cheese first, then sauce. The spumoni, a frozen Italian dessert somewhere between ice cream and Italian ice, is best with all three flavors (chocolate, vanilla, and pistachio) mixed together. The sprawling old-school Italian restaurant is open year-round, but it’s by far the most popular in summer, when you can take advantage of the ample outdoor seating. A one-time haunt for writers like Ernest Hemingway and E. E. Cummings, Minetta Tavern has been around since 1937 -- and based on the black-and-white photos and stained old mural in the dim dining room, you’d think it hasn’t changed a bit. The restaurant was actually revived by big-name restaurateur Keith McNally (of Balthazar fame) in the late aughts, and now is one of the best modern steakhouses in the city. The cote de boeuf is the big-ticket item, but it’s the dry-aged, ridiculously rich $33 Black Label burger that Minetta is most famous for. Noodle Bar was the very first restaurant in acclaimed restaurateur David Chang’s Momofuku empire, which has since expanded globally with several restaurants, bakeries, and products. 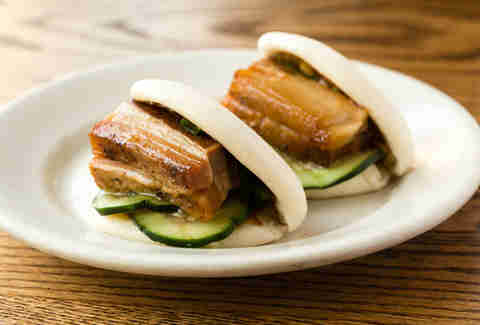 It also helped spark New York’s ramen frenzy and is responsible for the steamed pork belly buns that launched a thousand copycats. The best part? Everything from the inventive steamed buns to rich bowls of ramen remain under $20. Midtown workers have been sidling up to the big wooden bar at P.J. Clarke’s since 1884 (even during Prohibition, when the drinking part turned clandestine). And though the restaurant has recently expanded into a mini-chain, the original still has that great old New York feel to it. 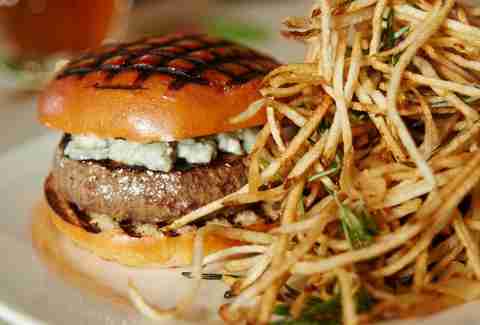 It also serves one of the city’s great classic burgers, a bacon cheeseburger dubbed the “Cadillac of burgers” by jazz legend Nat King Cole. 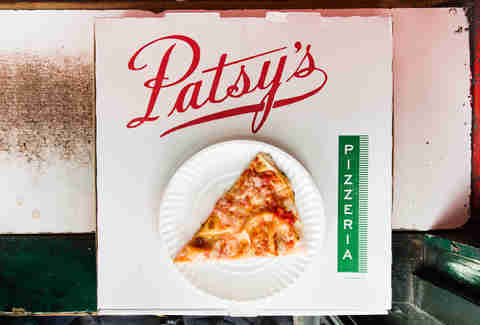 The original Patsy’s in Harlem, unaffiliated with the rest of the Patsy’s around the city, is a real piece of New York pizza history. Open since 1933, it was not only one of the first pizzerias in the city, it’s also the one that supposedly pioneered selling pies by the slice. It still uses the original coal oven, which gives the thin, crisp crust a hint of smoky char that your average corner slice joint can’t pull off with its gas ovens. Despite the waiters’ crisp white shirts and black bowties, Peter Luger is far more casual than some of New Yorker’s other old-school steak joints: There are no white tablecloths and no frills. 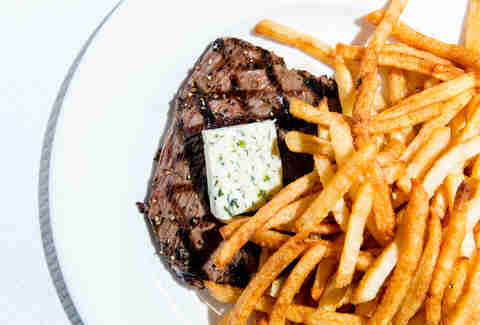 The dry-aged steaks are served on the same plate they’re broiled on, swimming in butter and steak juices, which certain servers will lovingly refer to as “vitamins.” They’re perfect that way, as are the crispy, beef fat-fried German potatoes, the mountainous wedge salad, and the thick slabs of bacon offered as a side dish. Now nearly a decade old, Roberta’s has managed to become and remain the definition of a hipster Brooklyn restaurant. The grungy compound of a space is home to a takeout shop, a vaguely tiki-themed backyard, a tasting menu restaurant (Blanca), an internet radio station, some beehives, and, of course, the pizza restaurant itself. But you don’t go to Roberta’s just for Brooklyn people-watching, you go for the wood-fired, Neapolitan-style pizza, like the famed Bee Sting, with sopressata and hot honey. Jewish appetizing stores (purveyors of smoked fish and dairy) are one of New York’s greatest food traditions, and Russ & Daughters is the most famous one. Here, you’ll find the city’s best smoked and cured fish -- ranging from pastrami-cured salmon to pickled herring to caviar -- carved delicately behind the counter at top speed by a staff of seasoned pros. 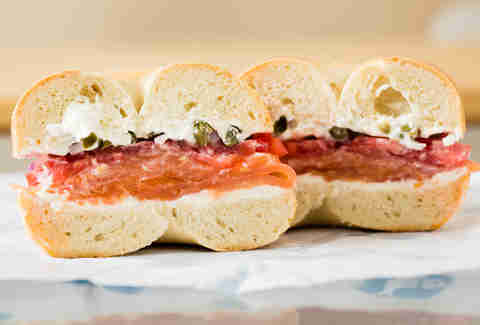 You are guaranteed a wait (the place is often packed, particularly on weekend mornings and holidays), but your patience will be rewarded with a perfect version of the classic New York bagel and lox. Just note that there’s no seating besides a little bench outside, though you can also head to the much newer Russ & Daughters Cafe nearby for table service and a dressed-up version of the same food. 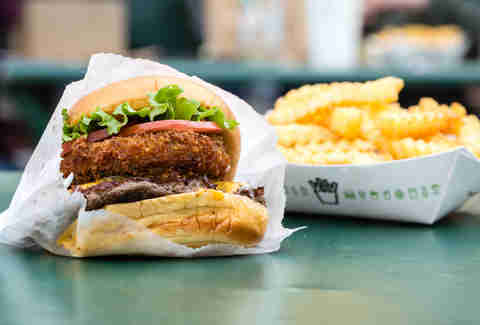 Over the course of the last 13 years, Shake Shack has grown from a humble hot dog cart in Madison Square Park to a global fast-casual burger empire. Despite that insane growth, it still manages to turn out excellent burgers made from better quality ingredients than you’ll find at any fast-food spot. Order a Shackburger and a Concrete and enjoy them at one of the tables by the original park location. Founded by Sylvia Woods, the so-called “queen of soul food,” in 1962, this landmarked Harlem restaurant has long been the city’s best-loved source of soul food staples like golden fried chicken, saucy ribs, and rich, meaty oxtail stew. It’s a favorite among politicians and celebrities -- everyone from Bill Clinton to Diana Ross -- and it can get pretty packed, but it’s worth it for a heaping plate of macaroni & cheese, collard greens, and a big piece of perfect fried chicken. Halal carts are a New York staple. In Manhattan, you’ll find a corner-parked cart slinging chicken over rice and falafel every few blocks. Still, The Halal Guys -- which started as a single food cart in Midtown in 1990 and has since expanded to a nationwide chain -- claims to be the OG, and whether or not that’s true, it’s definitely the most popular. You’ll understand why when you dive into a big pile of tender, heavily seasoned chicken and lamb over rice straight from the cart’s griddle. And don’t skimp on the famous white sauce. Chef April Bloomfield basically introduced the concept of a “gastropub” to NYC when she opened the Spotted Pig in 2004, which is renowned for her rustic, meat-centric cooking that’s recognizably British while still defying all stereotypes about bad British food. The standards at this cozy (and often packed) restaurant include deviled eggs, chicken liver toast, and a famous Roquefort-topped burger. To ensure you get a table, get there early (like, 5pm early) or late -- the kitchen is open until 2am every day. Once upon a time, X’ian Famous Foods was an under-the-radar gem in the basement of Flushing’s Golden Shopping Mall. Then Anthony Bourdain showed up to gush over its spicy, tingly cold skin noodles and cumin-laced lamb “burgers,” and the place turned into a wildly successful chain. 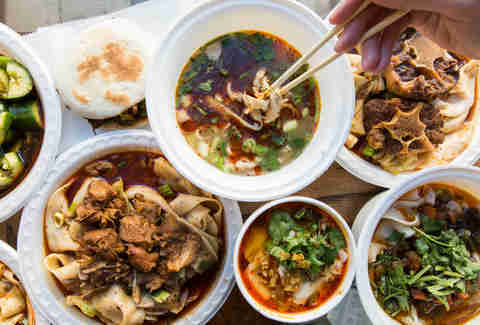 You’ll now find X’ian locations all over the city, all serving the same menu of spicy and affordable hand-pulled noodles, lamb burgers, dumplings, and soups. Marguerite Preston is a freelance writer based in Brooklyn. She’s been obsessing over NYC restaurants since approximately 2009.